Sometimes there is no greater feeling than getting in the car and just driving. Abandoning all chores and grocery stores and just being free. Opening the windows and letting the breeze blow through you hair. Even better if the breeze is from the ocean and the air is salty and fresh. Finding unexpected treasures along the way, a roadside fruit and vegetable stand, an antique store or a café with fresh made goodies for the road. Packing a picnic, stopping for a walk along a beach you've never seen before, to clear your mind and stretch your legs. These are all the things that make a seacoast drive a must-do, just for the pure joy of it. Here are some great Nova Scotia seacoast drives, where you are sure to enjoy magnificent views of the ocean, and you might just find a little something unexpected. 1. Cabot Trail: Clockwise or counterclockwise, the Cabot Trail has often been named one of the most scenic drives in Canada. Winding your way through the Cape Breton Highlands National Park, hugging every curve of the road, is absolutely exhilarating. If you just want to drive and experience the breathtaking scenery, the entire thing will take five hours without stops. Some parts are quite steep, so be sure your car is in good working order before heading out. If you want to plan a few stops on the way, it's a great idea to drive the trail over a couple days, especially if you want to take in some activities, like whale watching in Pleasant Bay or hiking through the park. There are lots of villages along the way. Visit the beaches around Ingonish, try some Acadian food in Cheticamp and stop by and see Joe's Scarecrow Village on the main road at Cap LeMoine. You can't miss it from the road. For those who want a remote experience, Meat Cove is a must. The tiny fishing community can be found at the northern tip of the Island after an eight km drive down an unpaved road. Over the years I have often heard Meat Cove being described as feeling like it's at the edge of the earth due to its remote location and spectacular views. Nestled in the hillside with craggy cliffs that overlook the ocean, Meat Cove is a nature lover's paradise. The small community boasts a community run restaurant, two lodges, a campground, picnic area and some great hiking trails. 2. The Lighthouse Route along the South Shore: Just an hour outside of Halifax proudly stands one of Nova Scotia's most famous icons, the lighthouse at Peggy's Cove. Often the first stop for any drive along the Lighthouse Route, I could easily spend an hour at Peggy's Cove just watching the ocean crash against the rocks. On a bright sunny day, they just sparkle. Traveling along the Lighthouse Route is one of my favourite drives. If you want to get out and explore, seaside towns like Chester, Mahone Bay and Lunenburg are perfect! Waterfront restaurants and pubs, great shops and galleries are all found in these charming towns. Following along the Route 3 highways will take you past sandy beaches, rugged coastline and beautiful island studded bays. You drive to your heart's content on this route all the way Yarmouth if you have the time. If you're ready to call it a day, you can always jump on the highway to return to your home base. There are plenty of points connecting to the main highway all along the way. Looking for a really unique experience? How about checking out life on a remote island, population 125? Catch the ferry to Tancook Island, a nine kilometre trip across the water from Chester. Pack a picnic or stop at Carolyn's Café and Crafts. Visit the Tancook Museum or Wishing Stone Studio Gallery. You can explore the island on foot or bring a bike for a nice little seacoast bike ride. It's a great little escape. 3. Beach hop along the Sunrise Trail: From Amherst to the Canso Causeway, the Sunrise Trail runs all along the Northumberland Strait and all along some mighty fine beaches. The trail travels through some beautiful farmlands and valleys but there are some interesting routes off the beaten path that also offer up some breathtaking scenery. Gulf Shore Road running through Stone House and Fox Harbour travels towards Wallace Bay with really beautiful views of salt marshes and tidal inlets. Visit the sandy beaches at McLean's Point or Fox Harbour Park. Further down the trail, take the turnoff to Heather Beach Provincial Park and you'll find a great view of the shore, with red sand bluffs. You can travel this road all the way to Cameron Beach at the end of the small peninsula. A trip around the Malagash peninsula leads past farmlands, which roll down to the red sandy shore. Stop at Blue Sea Corner at the top of the peninsula and head down to Malagash Blue Sea Beach Park. Since you're already nearby, be sure to take a tour of Jost Vineyards. 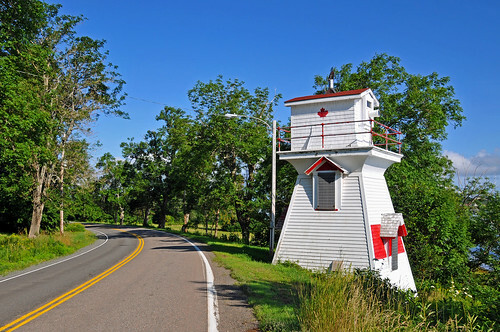 The Shore Road into Pictou takes you past Waterside Provincial Park and Caribou Island. The area's wetland is a great for bird watching. Bald eagles and osprey are a common sight. 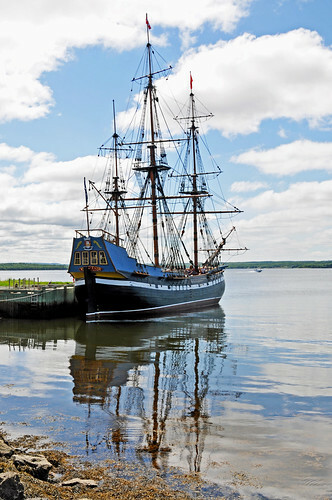 Once in Pictou, enjoy the Harbour and be sure to visit the Tall Ship Hector when she is in port. Route 289 will take you to Little Harbour Road and Melmerby Beach, very popular among locals. Pack a picnic and travel up to Powell's Point park for some great beachcombing. Another great seacoast on the Sunrise trail follows along Big Island. Crossing a 2 kilometre causeway, the road travels to the tip of the island to Big Island Beach. Continue along to Arisaig and Lismore. Arisaig Provincial Park has fossils dating back millions of years with interpretive display to learn more about them. Lismore has a colourful little harbour full of fishing boats. If you are staying in Antigonish a drive to Cape George is a great way to spend the day. 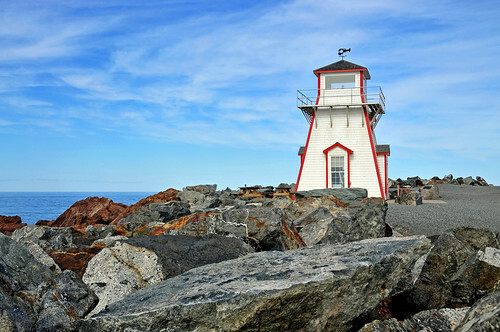 Travel up to the Lighthouse where it's said you can see Cape Breton on a clear day then continue around Ballantyne's Cove, a busy fishing community. There are little jewels all along the Sunrise Trail. These are only a few and you only need to travel off the beaten path a little to find them. 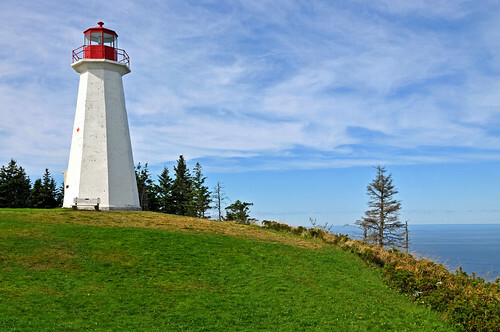 4.Digby Necks and Islands Scenic Drive: No ordinary scenic drive, to fully experience this "neck" of the woods you'll also need to take a couple of ferries. A long peninsula jutting into the Bay of Fundy, Digby Neck is followed by Long Island and Brier Island. You will want to plan a full day for this quaint seacoast experience. Starting in Digby, it takes a approximately an hour and a half to drive to Brier Island including ferry times if you decide to travel straight through. Ferries run 24 hours a day and cost $5.25 payable by cash. The ferries are timed just right so that you are able to drive from one to the other and hop right on to the next one. However, they are also small so if there is a lot of traffic, you will have to wait in line. If you are up for taking your time and planning some stops along the way, consider Sandy Cove on Digby Neck. It's the narrowest stretch of land on the peninsula with a beautiful sand beach. You'll meet your first ferry to Long Island at East Ferry on Digby Neck. Once on the island, explore the rugged coastline. 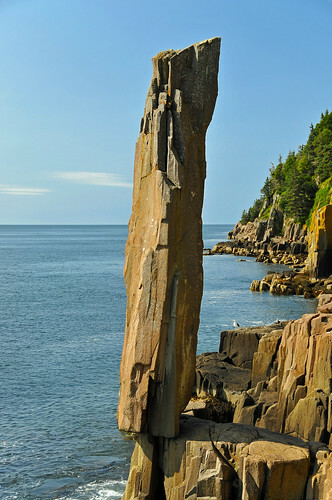 Take the hiking trail to Balancing Rock, a remarkable basaltic sea stack balancing on its tip. Visit the Boar's Head lighthouse, where the tides have carved the shape of a boar's head into the rocks. Next up - Brier Island. With three lighthouses, fantastic bird watching opportunities, coastal hikes and whale watching, you'll want to bring your camera and binoculars. No matter how far you decide to travel along this little piece of heaven, you are sure to be amazed. There are whale watching cruises departing from Digby Neck, Long Island and Brier Island, so you may want to plan one into your day. If you're planning to take in a cruise from one of the islands, be sure you plan a little extra time for the ferry crossings. 5. Evangeline Trail around Yarmouth: I've always enjoyed my trips to Yarmouth. I love to drive past all the old sea captain's houses and I'm always amazed at the grandeur of them. A drive through the town is a good way to start this seaside drive. A friend of mine recommended a charming route from Yarmouth through to the communities of Sand Beach, Kelly's Cove, Rockville and Chebogue Point. There is a beautiful view of the ocean all along this route with a view of Cape Forchu Light Station in the distance. After seeing the Light Station standing so proudly in the distance I recommend you take the actual drive out to see it up close and personal. Loop back up to Starrs Road towards the town. Following along Highway 304 you'll pass through the community of Yarmouth Bar. It's a small fishing village and the sits on a narrow sand and rock bank connecting the peninsula of Cape Forchu to the mainland. All the rocky breakwaters make for a very interesting site. 6. Along the Eastern Shore: Living in Dartmouth, I love to drive out to Lawrencetown Beach after supper. You can start to peek at inlets and bays as you get closer to the beach. Best of all it's only about a 20 minute drive! Stop for a bite at the MacDonald House Tea Room. It's a great place to fly a kite, overlooking the beach. Okay, so these are just a few of the amazing seacoast drives Nova Scotia has to offer. A province with 7,600 kilometres of coastline (not including the islands) is bound to have a few. And I know our locals will have even more favourites that are not mentioned. So I encourage you to share your favourite seacoast guide with us. Scenic inland drives are always welcomed as well. *A very big thank you to those who shared their personal photos with me for this post. And to Dennis Jarvis, a very talented member of our Flickr group. His photos are beautiful and his descriptions are so informative and interesting. We are very thankful for all of his contributions for the past three years.